NMT is also capable of obtaining ionic/molecular fluxes in 3D by measuring the concentration gradient in all x, y and z directions. Non-invasive Micro-test Technology (NMT® ) is developed based on the ‘vibrating probe’ technique started by Dr. Lionel Jaffe from Marine Biological Laboratory, Woods Hole, Massachusetts and Dr. Ian Newman from Tasmania University of Australia in the early 1990s (please see literatures here). 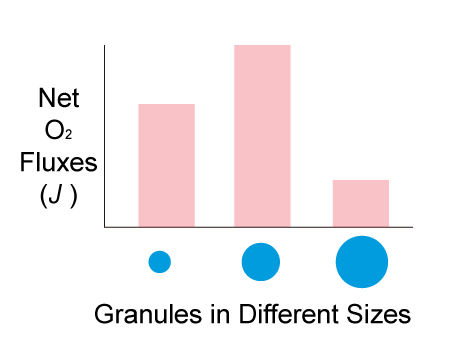 Without touching the samples, NMT is able to tell researchers how fast specific ions and/or molecules are going in or coming out their living samples. NMT will detect ionic/molecular fluxes (up to pico(10-12)moles*cm-2*s-1） in liquid media near the surface of samples click to see how it works?, which could be condensed organelle, single cells, tissues up to small intact organisms. 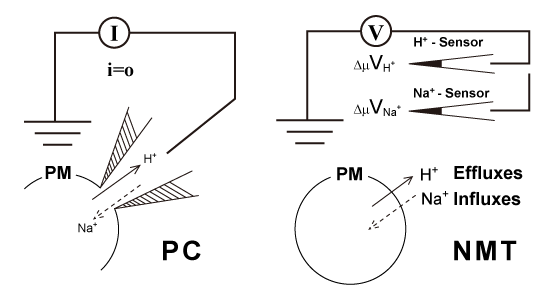 NMT® can also help researchers to obtain information such as concentrations and motion directions of specific ions and molecules going in/out of the samples in optimized buffers. H+, Ca2+ , K+, Na+, Cl-, NH4+, Mg2+, Cd2+, NO3-, O2 , H2O2 , Glucose, Glutamate and IAA can be measured individually or in combinations of two. What new information can NMT bring into my research? click to see more......? A symbiotic granule composed of algae and bacteria is being developed to optimize the wastewater treatment processes. 2) Because NMT can tell people how fast and how much oxygen is releasing or absorbing by the granules, it can be plugged into calculations to quantatively optimize the wastewater treatment processes. Poplar is an excellent model to study salt stress/resistance, but there are few techniques suitable to study Na+, K+, Cl- etc. which are essential players in this process, especially with living roots of Poplar. Chen's group has tried patch clamp for quite some time but no significant progress not only due to the Giga ohm seal challenges, but also because of the facts that when there are equivalent amount of transportations of both Na+ and K+ in the root of Poplar, the patch clamp will end up with '0' current if they are moving in opposite directions. Where is the Ca2+ coming from? Calmodulin (CaM) is an important modulator of second messenger - Ca2+. But when CaM plays its role inside cells causing the falling of rising of internal Ca2+, there is always an critical issue if these Ca2+ being released from cellular Ca2+ stores or from being transported from external media. 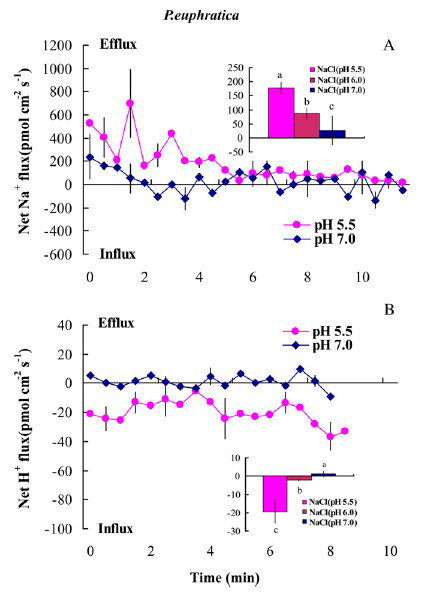 Because of its non-invasive nature, NMT was able to detect the influxes of Ca2+ and directly confirmed the confocal data showing an increase of internal Ca2+ concentrations. where J is the ion flux in x direction, dc/dx is its concentration gradient and D is its diffusion constant. 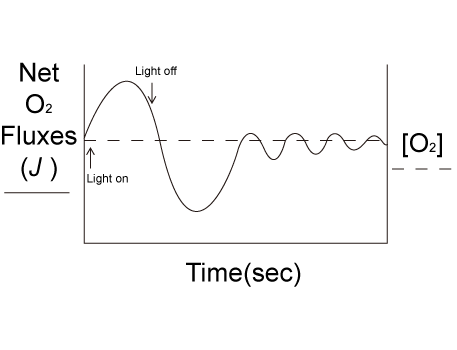 The direction of the flux is derived from Fick’s law of diffusion that relates the concentration gradient to the diffusion coefficient. Kochian, L V, Shaff J E, Kuhtreiber W M, Jaffe L F & Lucas W J (1992) Use of an extracellular, ion-selective microelectrode system for the quantification of K+, H+, and Ca2+ fluxes in maize roots and maize suspension cells. Planta 188, 601-610. Arif I. & Newman I.A. (1993) Proton efflux from oat coleoptile cells and exchange with wall calcium after IAA or fusicoccin treatment. Planta. 189, 377-383. Smith, P.J.S. (1995). 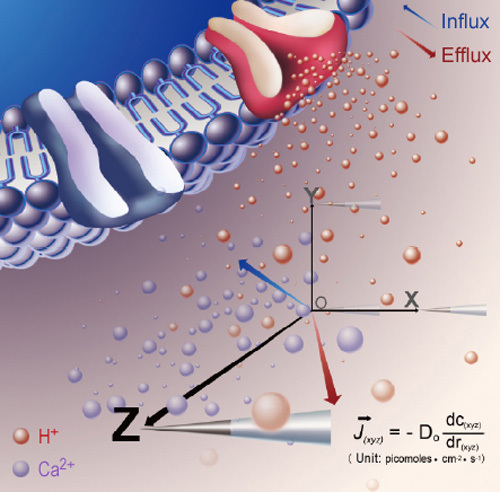 The non-invasive probes - tools for measuring transmembrane ion flux. Nature 378:645-646. Shabala S.N., Newman I.A. & Morris J. (1997) Oscillations in H+ and Ca2+ ion fluxes around the elongation region of corn roots and effects of external pH. Plant Physiology 113, 111-118. Hawkins BJ, et al.A comparison of ammonium, nitrate and proton net fluxes along seedling roots of Douglas-fir and lodgepole pine grown and measured with different inorganic nitrogen sources. Plant, Cell & Environment.2008, 31(3): 278–287. Nemchinov LG, et al. Calcium efflux as a component of the hypersensitive tesponse of Nicotiana benthamiana to Pseudomonas syringae. Plant Cell and Physiology, 2008, 49(1): 40-46. Ramos AC, et al. A pH signaling mechanism involved in the spatial distribution of calcium and anion fluxes in ectomycorrhizal roots. New Phytologist, 2009, 181(2): 448–462. Sun J, et al. NaCl-induced alternations of cellular and tissue ion fluxes in roots of salt-resistant and salt-sensitive poplar species. Plant Physiology, 2009, 149: 1141 - 1153. Sun J, et al. H2O2 and cytosolic Ca2+ signals triggered by the PM H+-coupled transport system mediate K+/Na+ homeostasis in NaCl-stressed Populus euphratica cells. Plant, Cell and Environment, 2010, 33: 943 - 958. Jeworutzki E, et al. Early signaling through the Arabidopsis pattern recognition receptors FLS2 and EFR involves Ca2+-associated opening of plasma membrane anion channels.The Plant Journal.2010,62(3):367–378. Alavian KN et al.Bcl xL regulates metabolic ef ciency of neurons through interaction with the mitochondrial F1F0 ATP synthase. Nature Cell Biology, 2011, 13(10): 1224-1233. Michard E, et al. Glutamate receptor–like genes form Ca2+ channels in pollen tubes and are regulated by pistil D-serine. Science, 2011, 332(6028): 434-437. Laohavisit A, et al. Arabidopsis annexin1 mediates the radical-activated plasma membrane Ca2+- and K+-permeable conductance in root cells. Plant Cell, 2012, 24(4): 1522-1533.